Blue Bell has enjoyed the untiring service from hundreds of dedicated volunteers for more than a quarter of a century. They have spent countless hours doting on our cats, publishing newsletters, developing websites, hosting fund raising events, and lending professional expertise in public relations, strategic planning, legal, administrative, photography, graphic design, construction and financial services. 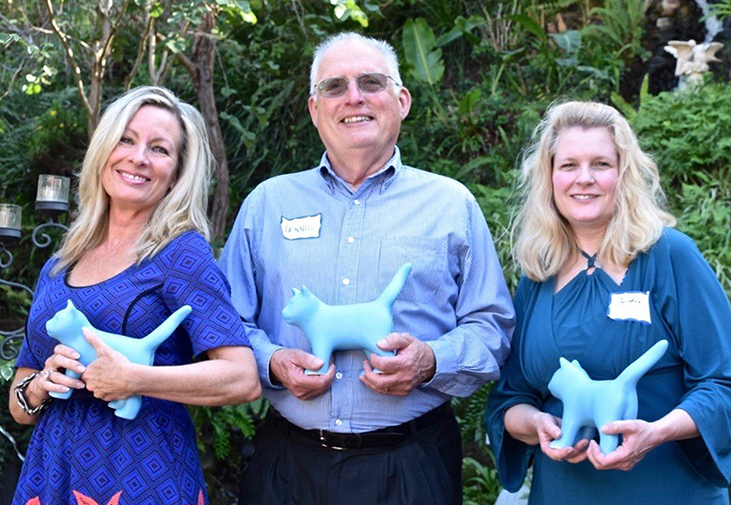 To recognize volunteers who have gone above and beyond the call of duty, in 2014 we established the Blue Bell Cat Awards that are presented at our annual Cat’s Meow Valentine Brunch each February. In addition to receiving a unique Blue Bell ceramic cat designed and hand crafted by Venice Beach Artist Gary Steinborn, each recipient is permanently recognized on a plaque in the cottage reception area.